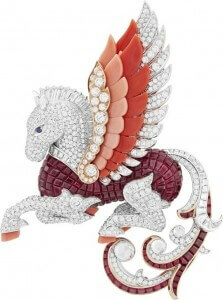 With the new clip collection “Noah’s Ark”, Van Cleef & Arpels enriches its enchanted bestiary. « Have you ever observed a dog approaching a bird? », he asks several times. It may seem it is he who designed, he who held the pencil, he who suggested the lascivious or tense forms of Noah’s Ark bestiary, but no, he just did the staging for the jewels, ample and stately, silent and secret, sometimes slightly unsettling. This is a staging that gives you a shivering sensation you could experience when encountering wild animals on their territory, where man is a stranger. Van Cleef & Arpels leads us in the expression of a new Jewellers’ World while remaining on its DNA marks such as lightness, poetic nature with animals “without claws”, but introducing a new way to observe animal universe, as it is, and not only with benevolence and generosity. The exquisite collection of sixty brooches representing animals, adorned with some legendary solitaires as Phoenix, Unicorn and Pegasus, fills us with wonder. The finesse of the craftsmanship and the acute observation of real animals is so perfectly translated by the “Mains d’Or » i.e. « Golden Hands” of the Maison Van Cleef & Arpels. The “Mains d’Or” “are highly experienced craftsmen, working for Van Cleef & Arpels, those who built its reputation. « They receive this title after spending a minimum 15 years in our ateliers”, says a historian specially appointed to present the exhibition. The result is sublime: delicate wings sculpted in a stone which seems to have achieved to be flexible. Slender plumages, onyx and dark wood set with fiery colored stones, bodies in opal or in golden mother of pearls, blades of turquoise and lapis-lazuli spread like fans and elegant neck and body movements… one could quote endlessly all the details that endows beauty, strength and life to this exquisitely beautiful clip collection of Noah’s Ark. Some animals seem to have been caught, in their real life, as could be read in their eyes and body posture, suddenly frozen to a halt. 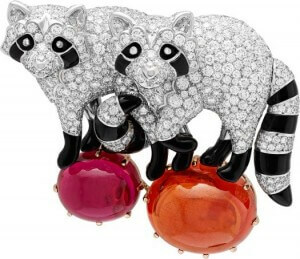 And this is where lies the novelty of Van Cleef & Arpels approach of animals. “Have you ever observed a dog approaching a bird?” asks Robert Wilson. 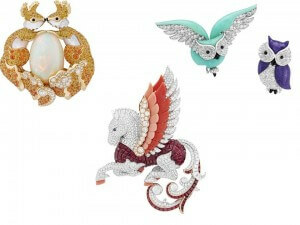 This sensation emanating from the new bestiary of jewellery clips is a new way to sculpt animals and to arouse us. Clip Racoons, white gold, spessartite garnet and pink tourmaline cabochons, intense colors respectively 36.26 and 12.70 carats, diamonds and onyx. Noah’s Ark Collection goes beyond simple reproduction of the animal (certainly artistically sublime) which always guided the jewel storytelling of Van Cleef & Arpels in an imaginary journey. 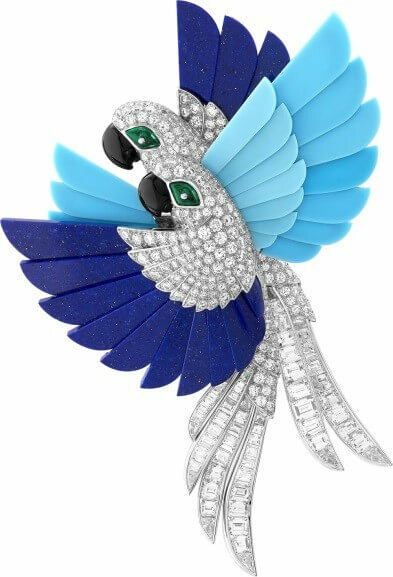 Since 1910, the animal theme is the heart of this Maison’s creations, hummingbirds, lovebirds, birds of paradise, butterflies or dragonflies have been the protagonists of the jeweller’s enchanted bestiary. A few years later, a pinch of fantasy is added with the clips Mischievous Cat and Ruffled Lion, reflecting an era when jewelry was more playful and easier to wear. Today, painting animal universe with cuddled, playful, mischievous or wild postures, Van Cleef & Arpels goes way beyond the jewel by literally enlivening metal and stones.